Integrative Acupressure as developed by Sam McClellan uses touch, finger pressure and gentle manipulation to stimulate the body’s own innate healing wisdom. Based on the oriental Healing System, it works with Acu-points along meridian pathways (without needles) to move energy and restore emotional and physical balance. Ideally, it is used preventatively to maintain robust health, immune functioning and well being. 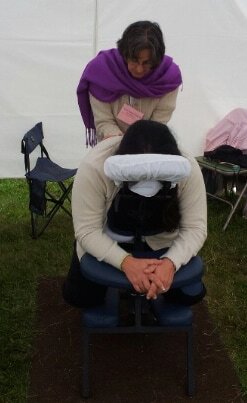 It is also helpful for treating pain and tension of the neck, back and shoulders, stress, nervousness, chronic fatigue, PMS and a host of other imbalances. Treatments are 50-60 minutes long. All treatments are performed on a massage table while you are fully clothed. It is helpful if you wear loose comfortable clothing. Jeans and clothing with thick bulky seams are difficult to work through. You may bring clothes to change into. The Meridians flow up and down the arms legs, back, torso, neck and head. There are powerful points along the spine and below the knees and elbows. Sometimes massage is performed on the abdominal organs, sacrum and other sensitive areas. Please speak up if you have areas that you don’t feel comfortable being touched. A treatment can be accomplished a number of ways. You may want to plan on taking it easy after your treatment if you are working on healing your immune system or building deep energy. The frequency of treatments depends on you. You make your own decisions about the level of health that you want for yourself. I will make recommendations based on that goal. Regular treatments produce cumulative results providing you are addressing the conditions that caused the imbalance. You should feel some results while you are lying on the table and you may feel continuing changes during the week. Integrative Acupressure complements most other kinds of treatment or therapy. It is pleasant and enjoyable and will most likely leave you feeling relaxed and energized.